Mesosaurus was the odd duck (if you'll excuse the mixed species metaphor) among its fellow prehistoric reptiles of the early Permian period. For one thing, this slender creature was an anapsid reptile, meaning it did not have any characteristic openings on the sides of its skull, rather than a more common synapsid (a category that embraced the pelycosaurs, archosaurs and therapsids that preceded the dinosaurs; today, the only living anapsids are turtles and tortoises). 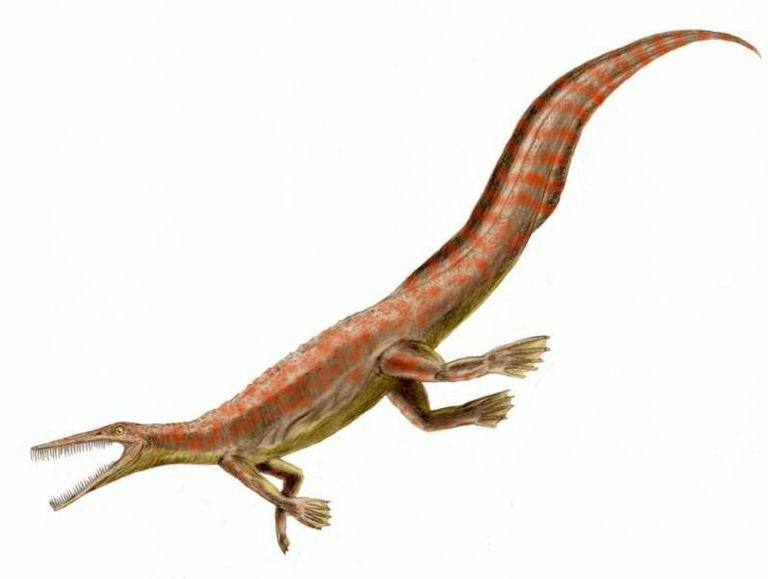 And for another, Mesosaurus was one of the first reptiles to return to a partially aquatic lifestyle from its fully terrestrial forebears, like the prehistoric amphibians that preceded it by tens of millions of years. Anatomically, though, Mesosaurus was pretty much plain vanilla, looking a bit like a small, prehistoric crocodile — that is, if you're willing the overlook the thin teeth in its jaws that seem to have been used to filter plankton. Mesosaurus is important for yet another reason: this is the earliest identified animal to have left amniote embryos in the fossil record (the eggs of amniote animals are either laid on land or incubate in the mother's womb, as distinguished from the eggs of fish and amphibians, which are laid in the water). It's widely believed that amniote animals existed a few million years before Mesosaurus, only recently evolved from the first tetrapods to climb up onto dry land, but we have yet to discern any conclusive fossil evidence for these very early amniote embryos.